Aaargghh! I got the flu bug. At least getting the flu shot back in October seems to have helped somewhat. I don’t seem to be having any gastrointestinal issues. Very grateful for that. But that’s why you’re seeing another post from me within the same month. My blog rule for this year was to just post once a month, but because I’m sick and have nothing better to do…here ya go! 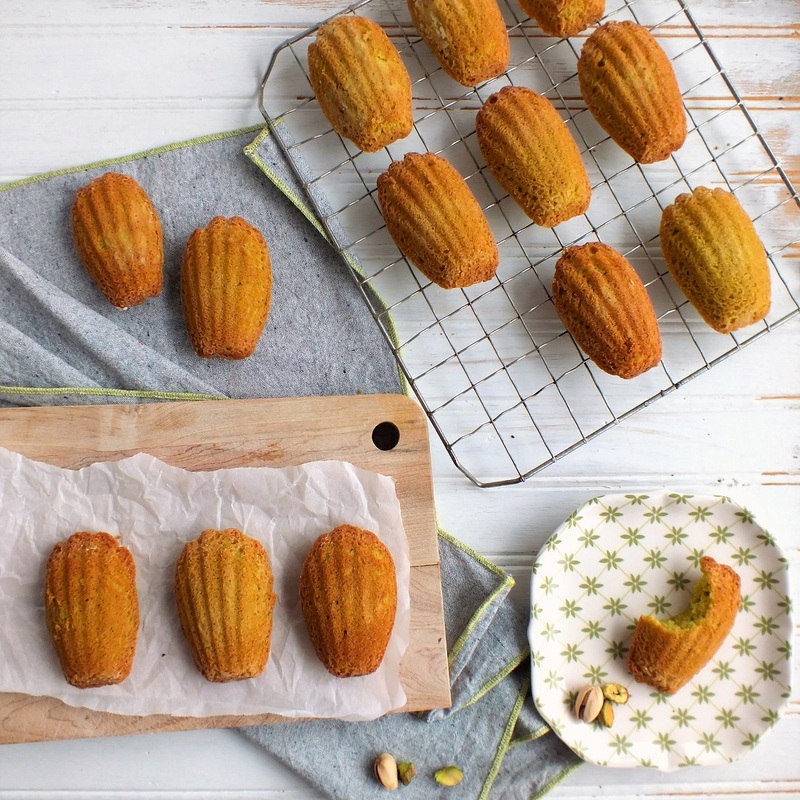 I decided to make pistachio madeleines. I had been wanting to make this for awhile. Had all the ingredients all ready to go! This is a recipe adapted from Thomas Keller’s Bouchon Bakery cookbook. I decided to brown the butter and to add pistachio flavoring from King Arthur Flour company. It’s a good thing I read the reviews on their website, because this is a very potent flavoring, and it is suggested to just use 1/8-1/4 teaspoon for most recipes. I added about 1/8 teaspoon and it was perfect. It truly tasted like pistachio, not almond extract subbing in for pistachios. Don’t get me wrong, love almond extract, it’s just that I think something with pistachios shouldn’t have to rely on almond extract. And I don’t know what is in the flavoring, but it’s spot on! This recipe requires some planning, but if you do the batter the night before, it really is a cinch. And if you don’t have madeleine molds for the distinctive shell feature, you can still bake them spread out on a baking sheet. 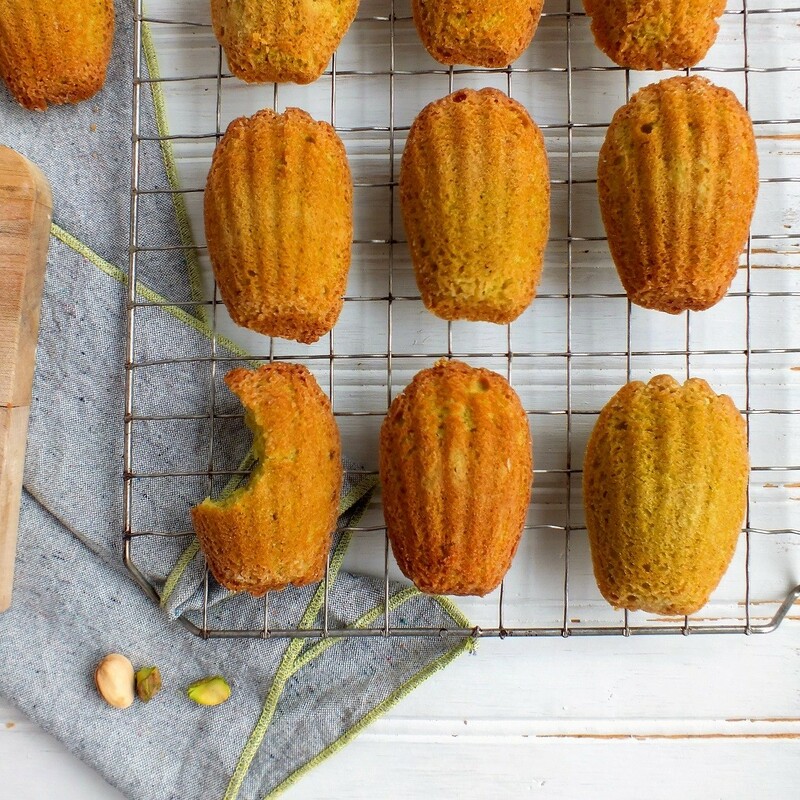 They might look a little plain, but they will still be impressive pistachio cookies. Brown the butter, scrape as much of it into a small bowl, let it cool somewhat, then add the brown sugar and honey to it. Stir with a whisk to dissolve the sugar and honey. Set aside. In a medium bowl, sift the flour, baking powder, and salt. Stir with a whisk several times until all ingredients are mixed together. Set aside. In the bowl of an electric mixer with the whisk attachment, place the egg and granulated sugar. Mix on medium-high speed for 1 minute, then increase speed to high and whip for about 5 minutes until the batter is pale and doubled in volume. You can also use a hand held electric mixer. Using a rubber spatula, fold the flour mixture into the egg/granulated sugar, a third of it at a time, until all the flour mixture is folded in. Scrape the bottom and sides to ensure all the flour is folded in. Stir the brown butter several times with a whisk and then pour it into the batter and fold it with a rubber spatula until the batter is smooth. In another medium bowl, place the pistachio paste and heat in a microwave for several seconds if it is cold and very stiff. If using the pistachio flavoring, stir it into the pistachio paste and mix in well. Using a rubber spatula, fold about a third of the batter into the pistachio paste first, fold, then fold the rest of the batter into it. Cover the top of the bowl and place in the refrigerator at least 6 hours to overnight. When ready to serve the cookies, heat oven to 350 degrees F.
Prepare madeleine pans by spraying each mold with baking spray. I instead brushed melted shortening on each mold, (but you can use butter, I just happened to run out of butter), then floured it by sprinkling about a teaspoon of flour on 12 molds coated with shortening, then placing another tray with 12 molds coated with shortening upside down on first tray and shaking them while together, then tapping them separately to remove excess flour. Fill each mold with one tablespoon of the batter. Bake about 10 minutes, or until tops are lightly browned and a toothpick stuck in the center of one of the madeleines comes out clean. Ovens vary, so start checking it at 8 minutes, but it can take up to 12-14 minutes depending on your oven. You want the tops to not be shiny or wet looking, and if you gently touch one of the tops, you want it to be fairly springy, not tacky or easy to dent. 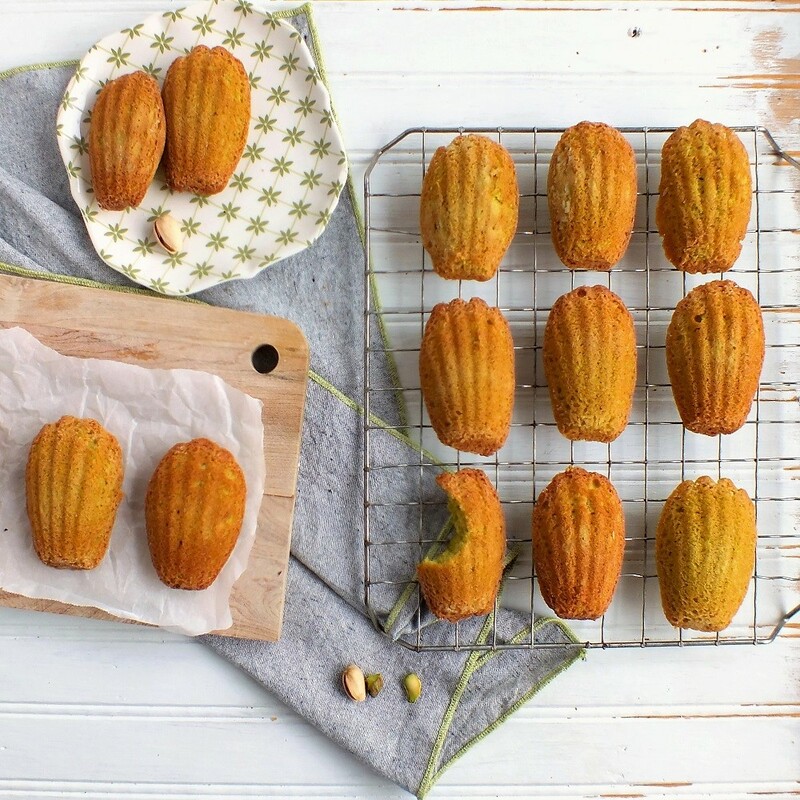 Unmold the madeleines to cool on a rack. When cooled, sprinkle with confectioners sugar, if desired. Pogi wanted in on the action. 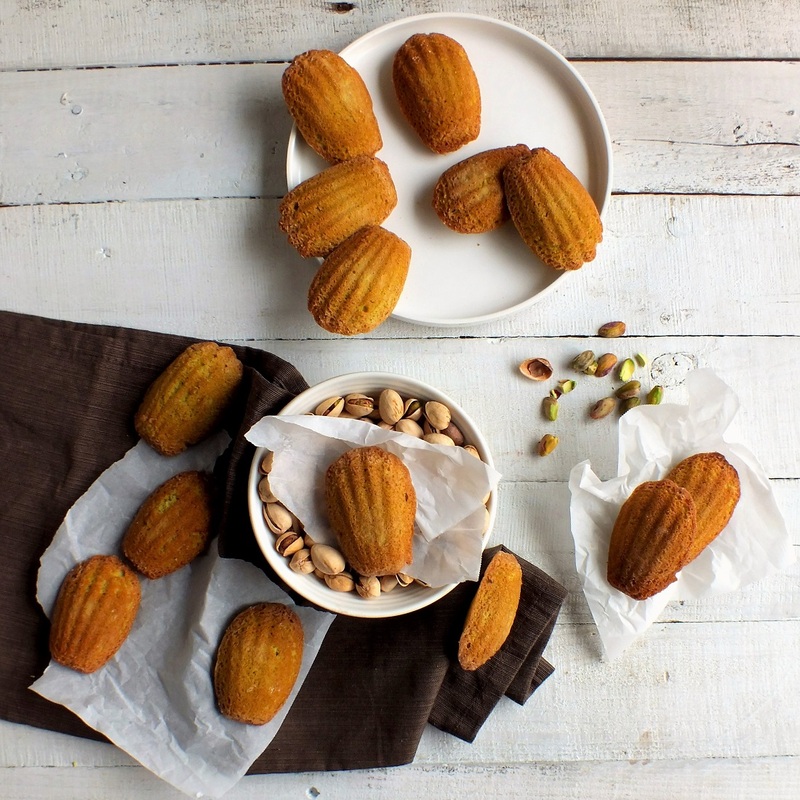 This entry was posted in baked goods, baking, cakes, cookies, dessert, food blogging, french, pistachios, snack, teacake and tagged bouchon bakery madeleines, brown butter, madeleines, pistachio, pistachio flavor, pistachio paste, thomas keller. Bookmark the permalink. Very cool. 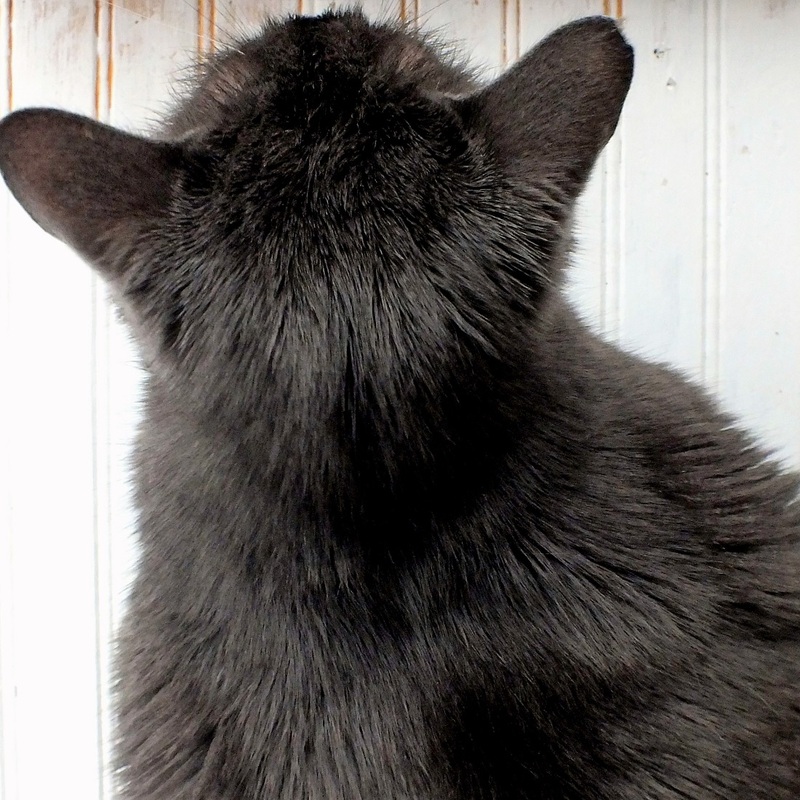 Cat cuteness. Hope all is well with you again. 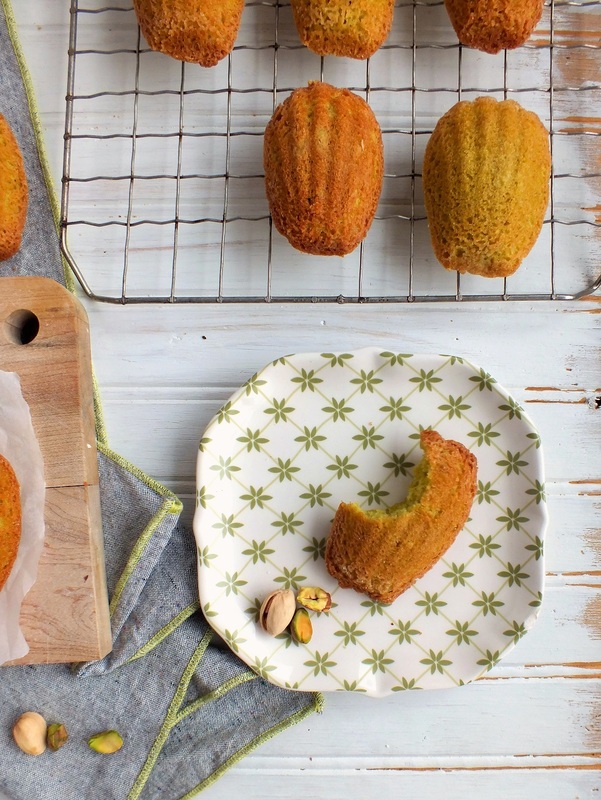 I so have to invest in a madeleines baking tray. The browned butter would go so well with the pistachio flavor, great adaptation. Love all your recipes! Thanks Lily!! They were good. I had to get at least two madeleine pans, so I could make at least 24 at a time. Have a great rest of your day!